After the Browns of Burr Lane we come to the Ball family. The old house was close to the factory, with its back to Burr Lane. Francis Ball lived in it. Francis Ball – let’s call him ‘senior’ — was born in 1778, the second son of Trowell-born stocking-weaver Francis and Mary (nee Sudbury) and had been a framework knitter in Burr Lane since 1805 when, with his wife Mary (nee Hirst), daughter of Thomas and Mary (nee Dickenson), he occupied a small area of land there, where the Albion Mill site is. On the land occupied by Francis senior, he built a cottage and work premises to begin his own business. These were enlarged in 1828 and in 1843 a four-storey factory was constructed. These Albion Works were the first large factory in Ilkeston and close by, on the same piece of land, was Albion House. The London Gazette of November 1848 noted that the partnership of F(rancis), T(homas), J(ohn) and W(illiam) Ball was dissolved. Francis senior lived in this house until he died in December 1850 while son Francis junior took over the old cottage for a while. Ball and Dunnicliffe had the factory in Burr Lane. Under the guidance of Francis Ball senior the family business grew and prospered, and the name of the company was changed from Francis Ball & Sons to Messrs Ball and Dunnicliffe when the family formed a partnership with a fabric designer, Melbourne-born John Dearman Dunnicliffe, then styled as a ‘lace manufacturer of Hyson Green’. (In 1850 he was also a Guardian of the Radford Poor Law Union). The Ilkeston factory was further extended in the early 1850’s. When Dunnicliffe severed his connection with F. Ball, he started as a lace manufacturer in the Lace Market, Nottingham. John Dearman Dunnicliffe left the business in May 1853 followed by Francis senior’s son Thomas, such that by 1862 his son William Ball was in effective control of what then became William Ball & Son. Francis senior died of pneumonia in 1850 and wife Mary in July 1863. Both were initially buried in the graveyard of the Independent Chapel but were removed from there on May 5th 1865 and buried together in the newly established StantonRoad Cemetery. Close by are buried their eldest son John and his wife, Elizabeth (nee Wigley). Francis and Mary had at least ten children. John was born on November 26th 1802. He lived with his parents and helped in his father’s work until the beginning of 1856 when he left the partnership. His first wife, whom he married in October 1833, was Selina Sudbury, daughter of stocking weaver William and Sarah (nee Thompson) but just over a year later Selina was dead. John eventually moved to Nottingham, married his second wife Elizabeth Wigley, daughter of victualler Jedediah of the Market Inn and Ruth (nee Ottewell) in July 1864, and died while resident at 42 Upper Talbot Street, Nottingham in March 1876. He was in business with his younger brother Alexander at that time. In July 1831 Ann married Robert Wigley, builder of Albion Place, brother of Jedediah, and thus uncle of her elder brother’s wife. Mrs. Lings was daughter Mary. She married George Lings in December 1839, the latter at one time shoemaker of South Street and then colliery agent/manager at his home village of West Hallam. After the death of husband George in February 1872 Mary returned to Albion House in Burr Lane where she died in October 1893. William succeeded his father . William was born at Ilkeston on August 29th 1809. Francis junior, lacemaker, married Eliza Meakin, eldest child of Thomas, glazier and plumber, and Ann (nee Phillips) in April 1838 (We met ‘Old Mr. Meakin’ earlier in East Street). They lived in Albion Place/Burr Lane before moving to Nottingham in the later 1850’s. And until 1867 their eldest son John was book-keeper for the firm, then called Messrs. Ball & Wilkins. Before he left for Nottingham the workmen of the firm met with him at the Wine Vaults and presented a leaving present – a silver cup — the presentation being made by John’s great uncle Thomas Ball senior, the oldest workman on the firm and brother of Francis senior (see West Side Cottages). At the occasion John remarked that he had enjoyed their confidence and respect as well as ‘the kindly manner in which every workman on the firm had ever treated him’; he hoped that their friendship and good fellowship, ‘though interrupted in its old channel, might still flow on and increase’. He should ‘ever retain a vivid remembrance of their kindness, and should always look back on the days spent in their society as the happiest of his life’. ‘Good feeling manifested throughout the meeting’. Mrs. Goddard was daughter Elizabeth who married James Goddard, joiner and builder of East Street in January 1846. They lived all their married life in that street and both died there – James in October 1890 and Elizabeth in August 1895. Thomas was a lace manufacturer in Nottingham, and was Mayor of that town for one year. Thomas, like John, initially lived with his parents in Burr Lane, as a lace hand to his father. In 1849 he married Mary Ann Amelia Walker Birkin, eldest child of Basford lace manufacturer Richard and Mary Ann (nee Walker) and then lived in the Park, Nottingham. He was Mayor of Nottingham in 1865-1866 and died at 6 Albermarle Street, Piccadilly, in London in August 1878, seven years after the death of his wife. His father-in-law was also Mayor of Nottingham on four occasions between 1849 and 1863. Thomas had a farm and lands at East Norton, Leicestershire which in his will he left to the use of his brother William for life. “the death of Mr. Thomas Ball, J.P…. occurred on Monday evening at his lodgings in Albermarle-street, London. Mr. Ball was born in the neighbourhood of Nottingham, and was brought up in the staple manufacture of the town. In early life he bestowed much study upon the design and manufacture of lace, and in course of time he succeeded to a most lucrative business. He then went into partnership with Mr. Dunnicliffe, and the firm produced some elegant material in glove fabric, which was then a very profitable branch of local trade. On the dissolution of this partnership, Mr. Ball carried on the business for some time with his brother, but a few years afterwards he retired altogether from business. “For some time Mr. Ball has been associated with the public business of the town, and has held office as town councillor, mayor, and magistrate. It was during his mayoralty in 1866 that the British Association visited Nottingham, and his hospitality and energy on that occasion were a credit alike to himself and the town. It was during this year, too, that Mr. Ball’s name was added to the Commission of the Peace. “Mr. Ball was a considerable traveller. In 1875 he visited America, delivering on his return a very interesting lecture to the members of the Literary and Philosophical Society; and in the spring of 1877 he, in company with some friends, took a journey through Egypt. From this journey he returned home with his health greatly impaired, and it is feared that he then sowed the seeds of the disease which has terminated fatally. “He was a director of Messrs. Moore and Robinson’s Bank in this town, of the Star Life Insurance Company, (and the Mercantile Steamship Company) and in these offices he showed considerable tact, judgment, and business capacity. Naturally of a suave and unassuming disposition, he sometimes evinced perhaps a certain amount of irresolution and indecision. His manners were those of a polished gentleman, and he enjoyed the esteem and friendship of a large circle of friends, by whom his death will be sincerely regretted”. Thomas’s body was brought back from London to Nottingham where he was buried at the General Cemetery, after a short and very simple service, in the same vault as that of his wife, on the hill side close under the cemetery chapel. Matilda married widower James Alexander Barker, an Ilkeston butcher, in January 1841. She continued to live in Ilkeston until her death at 1 North Street in February 1889, aged 70. Alexander married Sarah Levers, daughter of Kensington framework knitter Richard and Hannah in April 1841, worked in the lace trade, whilst living at Kensington and then Anchor Row before moving to Nottingham in the 1850’s. Sarah died there in 1866, aged 45. Eight years later Alexander married dressmaker spinster Ellen Hopewell. Maria died in 1827, aged three years and nine months. When Albion House was built young William (son of Francis senior) lived in it until he built Dodson House, when he and his family removed into it. The name of the house may be derived from the maiden name of Ann Fritchley, wife of farmer and butcher William, whose family had interests in Dodson Croft in Burr Lane up to 1858. On Christmas Day, 1836 William Ball had married Susannah Bennett, (sister-in-law of Elizabeth, proprietor of the Wine Vaults) and raised a family of six children, all of them eventually moving into Dodson House in Burr Lane. In 1866 William senior gave evidence to the House of Commons Select Committee on Railway Bills, at which time he was described as ‘of the firm of Ball and Wilkins, lace manufacturers, Ilkeston and Nottingham’. In his statement he said …. “We have a warehouse at Nottingham for the sale of our goods, most of which are manufactured at Ilkeston. Either me or my son go nearly every day from Ilkeston to Nottingham and back again for the purpose of our business….the time usually occupied in going to Nottingham at present is as much as an hour or an hour and a quarter. Our material is sent to Ilkeston, in the first instance, from Nottingham, manufactured at Ilkeston, and then taken back to Nottingham, so that it goes twice between Ilkeston and Nottingham. We do not encourage the railway at all, or next to nothing, as it is an inconvenient mode of sending our goods….our goods are constantly taken backwards and forwards by carriers, who take them quicker and cheaper than the existing railway communication”. The carriers would collect Ball’s lace and hosiery goods from the Ilkeston factory and deliver them directly to the Nottingham warehouse, at an annual cost of about £60, as William estimated. He continued: “There is very little accommodation (by the railway company) for Ilkeston persons having a trade with Nottingham, which, in my opinion, has been prejudicial not only to our own business, but to the trade at Ilkeston generally. One lace manufactory at Ilkeston has been standing idle for three or four years, I believe” (possibly referring to Bailey‘s factory in Heanor Road). “The district of the Erewash Valley (is) a populous district, for which Nottingham would be the most convenient and natural market town. The trades principally carried on in the district are lace, hosiery, the glove manufacture, and such like…also collieries and ironworks … The lace and hosiery trades in the valley…are generally like our own, all in close connection with houses at Nottingham; and between them and Nottingham, I think it is very important that the communication should be as direct, as speedy, and as cheap as possible. The people employed in the coal and iron trades go in considerable numbers to Nottingham to market. All this traffic must and does go round by the Trent junction”. He supported a more direct line to Nottingham, to cut time and cost, and his view was shared by others. “Residing at Ilkeston myself, I know the principal people who reside there. The signatures on the petition presented to the House from Ilkeston comprise the respectable and important part of the population. I do not think there is a name on that petition that I do not know personally; it represents the real respectability and feeling of Ilkeston”. He served on the old Highway Board and then on its successor the Local Board, many years its chairman. He promoted both the Gas and Waterworks Companies and served as a director of each for many years. With Matthew Hobson he helped provide the Non-conformist cemetery on Stanton Road. William senior died at Dodson House about 10pm on Tuesday February 2nd 1886. His body lay in rest there until Saturday, the day of his funeral, when the cortege left the house, proceeding up Burr Lane and East Street and into the Market Place. In religion William had always been a thorough Non-conformist and member of the Independent Chapel and so a short service was then held there before the procession moved on to a first-class grave at the GeneralCemetery in Stanton Road. The Pioneer tried to reflect the mood of that day. “The quiet and reverend behaviour of the crowds of spectators lining the streets, and the many drawn blinds, were proof that the townspeople knew how to honour the remains of one who knew how to live not for himself alone, but found a pleasure in relieving the wants of others’. However the paper couldn’t seem to resist introducing a political note of discord into the solemn event. It continued “The only regrettable circumstance in connection with the mournful ceremony was an unseemly disturbance which was created near the Cemetery gates, during the reading of the burial service at the grave, by a rabid follower of the ‘Grand old man’ (The Prime Minister William Gladstone) who had come into collision with the police, and was yelling out the name of ‘Gladstone’ at the top of his voice, to the great disgust of the mourners and every other sensible person within earshot. It is an old saying that ‘there is always a fool in a fair’, but surely no man ought to be so devoid of feeling as to act in an indecorous manner when the last offices for the dead are being performed”. William’s political colour was Yellow (a Liberal, as Gladstone later was) while the Pioneer was Ilkeston’s Tory organ. The ‘Liberal’ Advertiser failed to record the altercation at the Cemetery’s gates. “By his demise, the poor lost a sympathising and liberal friend, and the town a faithful servant and generous benefactor”. (Trueman). William’s wife Susannah continued to live at Dodson House while the business now passed to son John. Susannah died in May 1892 and was buried with her husband. There were six children of William senior and Susannah…..
Susan, the eldest, married young Bailey, of Bailey’s factory, on the Common, and lived in the house built by Bailey & Co. on Heanor Road. Susan married Joseph Bailey, lace manufacturer of New Street, in 1859. The eldest son, William, left Ilkeston, and I understand became a gentleman farmer. In November 1875 William junior married Elizabeth Goose (nee Brighty) of Lincoln, widow of innkeeper and farmer John George Goose and daughter of Boston beerhouse keeper and brewer Joseph and Elizabeth Brighty. 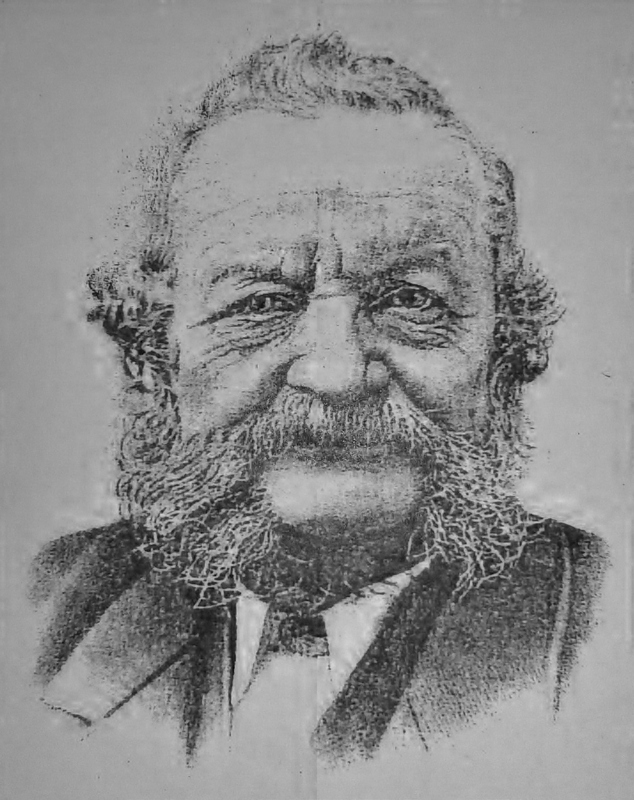 After a short time spent in the Boston area, he returned to Ilkeston and became proprietor of the Sir John Warren about 1880. Mary became Mrs. Fry. Her husband was in the firm of Dunn & Fry, booksellers, South Parade, Nottingham. Mary married William Fry, lace manufacturer of Nottingham in August 1871 who at that time was recorded as a bookseller of the Parade in Nottingham. Dunn & Fry were booksellers, stationers and circulating library of 12 South Parade in that city. Thomas married Louisa Tansley in March1873 and became proprietor of the Trip to Jerusalem Inn in Nottingham. John remained with his father. Youngest son John joined his father in the family business which was now called William Ball & Son. For a time he had occupied Albion House after his father until it was put up for sale in May 1864. In 1869, by letter of transfer, John was received into the Ilkeston Independent Church from the Poultry Congregational Church in London – he had been serving as an apprentice in a lace warehouse in Wood Street in that city – and thus John joined the Church of which his great-grandfather was an original member. Thereafter he was a long-serving Deacon of the Church, for a short period its Secretary, and was a significant contributor to the Building Fund of the new Wharncliffe Road Congregational Church, opened in 1904 – one of the foundation stones of that church was laid by John on April 27th of that year. John lived most of his adult life at Dodson House and died there, a bachelor, in September 1921. At his funeral he was described as …. “a simple man — simple in utterance and simple in habits. He loved his home, his garden and his flowers…. He loved the beautiful, the simple, the unaffected and children had much in common with him”. John was a J.P. for a time but “his leanings were not towards a public life, and the home and the factory provided a sphere in which his main interests were centred”. He was buried in Park Cemetery. Lizzie Ann married Dr. Wood. Youngest child Elizabeth Ann married Robert Wood, surgeon and doctor of the Market Place in April 1872. By 1870 all three sons had been brought into the family business but five years later only youngest son John was left with an interest in it. The Ilkeston Pioneer noted in September 1875 that the partnership of W. Ball & Sons, lace manufacturer of Ilkeston and Nottingham, had been dissolved, as regards W. Ball junior and Thomas Ball. And into Albion Place we find the Barker family.